So I’ve been debating for a while whether or not to write this post but the more and more I thought about it, the more and more I figured it’s better to share in hope that I can provide information or insight that can help someone else out there? I am absolutely convinced that the false positive statistics are far higher than the doctor’s offices claim. it happened to me twice? Get a positive at home test result. Call your Dr’s office and schedule your first appointment, usually after 8 weeks, most miscarriages happen very early on so waiting gives them a bit of time to make sure the pregnancy is indeed viable. Rh Testing is typically done at 28 weeks; this test is to determine your blood type and whether you are Rh Negative (ie: A-, B-, etc. ), if you are Rh negative and there is a chance your child could be Rh positive, you will get a Rhogam shot to prevent issues of cross-contamination between your and your baby’s blood. See this link for more information about Rhogam and Rh-Negative Moms on whattoexpect.com. Schedule appointments with your OB/Midwife every week from weeks 36-Birth (Generally 40 weeks but that is not a hard and fast rule). If the doctor’s have any concerns about your pregnancy you may schedule a C-Section for a number of reasons; one example is if your baby is breech – when the baby has not switched positions to head down in preparation for birth and can no longer move due to their size and how far along you are in the pregnancy. Typically a C-Section is scheduled at 39 weeks to lessen the chance of you going into labor naturally. You will then either deliver the baby via vaginal birth or C-Section. It’s a fact ladies, best to face it now haha! YAY! You have a baby!!!!! Let the real fun begin! Please bear in mind that this is a very rough guideline for pregnancy – each one is different and there may be certain complications and issues that come along the way, and your doctor may do things much differently than mine – but generally speaking this is how your pregnancy will be structured. Okay so, back to my point. When I was pregnant with our daughter, I was over the moon and couldn’t wait for my first appointment to make things “real.” Those first few weeks seemed to be the slowest of my life! BUT 8 weeks did indeed come. I’d go in, they’d do an ultrasound, we’d see that beautiful baby and hear the heartbeat and find out what we were having. Okay so maybe I wasn’t quite that naive but the fact is, if you’ve never done this before, you just don’t know! So imagine my soul being crushed when I found out that that they weren’t going to do an ultrasound until 20 WEEKS?!?!? Part of the reason for this delay is due to my particular doctor’s office, I’ve heard of others where it is common place to do one earlier to check on everything. It is also fairly common to do an early ultrasound if you’re unsure of when you may have conceived, but if you’re fairly certain of your lady dates than this is kind of a moot point and unnecessary. And of course insurance also has many parameters which dictate whether a costly ultrasound is deemed medically necessary so throw that extra wrench in there! Thanks insurance!!! The next topic of discussion at your 8 week appointment is determining which (if any) types of genetic testing you would like to do. 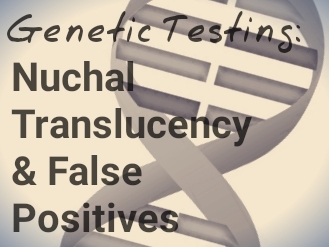 The earliest genetic testing we were offered was Nuchal Translucency which is done sometime between 11-14 weeks. This testing was covered by our insurance and included my hook word – ultrasound. This test is done, in particular, to determine your risk for Down Syndrome in addition to other chromosomal abnormalities. So there we were, 12 week appointment and we got to see our baby! Everything looked great, baby looked good and nothing was of any concern to the ultrasound tech while we were there. The actual Nuchal Translucency was within normal range. The Nuchal Translucency Test is done by measuring the fluid at the back of your baby’s neck while their skin is still translucent – or see through. The typical range is below 3mm per our doctor. See this link for more information regarding testing. Okay so that was A LOT of info, and please, please, please bear in mind that I am not in any way shape or form a medical professional, this is simply what I’ve learned from both my first and second pregnancies. Then a few days later, I received a phone call. My risk for Down Syndrome was found to be 1:180, I didn’t care that that left me with a 0.6% chance, I was scared. Again, the thought that the test would be anything but a photo op was not something that I had entertained for a single second. The next step was to schedule an appointment with a perinatologist, they got me in within the next day or so. Of course, in my mind, it was of the utmost importance to get in me ASAP because something was definitely wrong. The perinatologist we were referred to could not have been any nicer, he calmly explained that it is common for these tests to result in false positives. They did an ultrasound in their office and confirmed that NT measurement looked good, that the nasal bone was visible (another good sign) and then talked to us about the next step. The least invasive of the options we were given was the MaterniT21 Test. Amniocentesis was another option but that would require a big needle and has a (slight) chance of causing a miscarriage. The MaterniT21 Test is a non-invasive blood test with virtually no risks to you or the baby so we opted to go that route. As a heads up, this test is not always covered by insurance and documentation has to be provided to deem it “medically necessary.” Your provider should do everything they can to ensure you don’t get any surprise bills after the testing. However; if you’re over 35 or considered high risk it is considered common practice do to this testing from the get-go without jumping through the other testing hoops, so insurance may not be as much of an issue. They told us the test results would take up to two weeks to get back, I can honestly say those were one-two of the most agonizing weeks of my life, the uncertainty was awful. BUT, we finally got the call. I was indeed part of the 5% that get a false positive during their NT Testing. On the plus side, they asked me “Do you want to know the gender of your child?” UM YES!!!! The fact that you can find out the gender through this test is often why insurance is so picky about whether it is medically necessary or not – some people opt to do it to find out the gender weeks before an accurate ultrasound prediction can be made. And right then and there, I found out on the phone, by myself, (in retrospect it was extremely anticlimactic but I was SO EXCITED!!!) that we were having a girl. Seeing as I tend to have the most complicated, un-complicated pregnancies… I also have a negative Rh blood type and said daughter was breech. But those are stories for another day – HA! Anywho, fast forward to our second pregnancy. Sitting in the office, discussing the options for genetic testing, my head said – don’t do it. I asked my doctor if a previous false positive gave me a higher chance of having a another and he said no, he’d never heard of that. We discussed that the NT testing was still one of the best screening methods and the least invasive, etc. etc. etc. And while I’d done my best to convince my doctor he should let me, I was told I couldn’t just do the MaterniT21 Test from the get-go and that insurance would consider it an elective procedure due to my age and lack of high risk status (don’t get me wrong, it is an absolute blessing to not be considered high risk!). And yet, I decided to go through with it again?!? Was I really that desperate to confirm that there was actually a baby in there – YES!!! And I truly figured, well I guess I’ve already gone through a false positive and that sucked but we were okay. And if there was a real positive, we’d like to know in advance. But the fact was, the numbers were in our favor that everything would come back hunky dory and we would get to see our little nugget. So I went in for the scan and the blood test, again – everything initially looked good. This time our risk was 1:115 based on the testing. (0.9%) Again, still scary. But this time I wasn’t scared. My husband and I got in the next day for testing, the same perinatologist saw us and was suprised to see us come through his door, again, but was still just as accommodating and comforting as the first time. He even told us he wouldn’t require the same follow up with him should we find out this was a false positive again. And he went through the spiel all over, again, about options and we settled on the MaterniT21, again. We got the phone call after 1 week, more accurately, on a Saturday night – this was my first indicator that everything was good – no way would they call on a Saturday night and tell us bad news! And…. I WAS RIGHT! YAY, YAY, YAY!!!! FALSE POSITIVE #2! I had beaten the odds twice by becoming part of the (so-called) 5%! This time, when they asked if I wanted to know the gender I requested that they write it down and I could pick up the envelope when we were ready and together. Um yeah…. that lasted until Monday when they opened…. But more importantly, my husband and I could open it together. A BOY!!! YAY! I guess my hope of this post is to give others out there a bit of insight into the general pregnancy timeline, and to talk about genetic testing and the risk and results of false positives. And also, if you’re ever wondering why someone was able to find out the gender or their baby before you could find out the gender of yours, it’s often because they’re going through more than they might be telling you. Gender is just simply a bonus to all of that heart-wrenching extra testing. I know that this story could have taken a much different turn if we had gotten an actual positive result and although we would have embraced any outcome in stride, we were blessed with a healthy daughter and are praying for another healthy baby at the end of this pregnancy. And while I feel like it may be overly dramatic to focus on what happens when you find out everything is okay (and you may be thinking the same thing, I wouldn’t blame you one little bit), any way you spin it – it was scary going through that, especially twice. And if this post eases the mind of just one other lady out there going through the same thing, it was worth writing.